The declared goal of the Aliante "Punto 5" project, is the one to reduce by half the size without halving construction quality and musical performance, which should both have to be kept at an high level. There are several elements that do contribute to make this miniloudspeakers pair an elegant and really exquisite creation: the small size, a slim cut, the black mat color, in which the cabinet is painted, matched with the two solid walnut wood side panels and the framed protection grid. 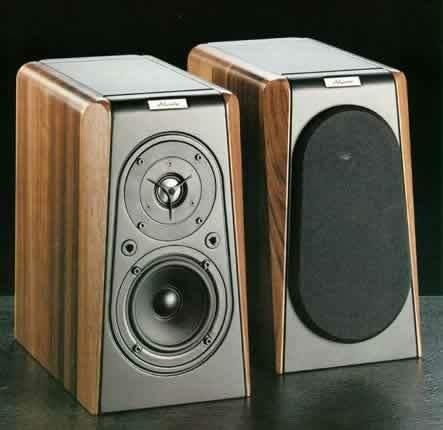 Even the small Aliante logo, placed on the front of loudspeakers, is noticeable for its class and moderation. Once the protection grid is removed the overall framework does not change, whether it gets a"Hi Tech" feeling that is quite fascinating. The tweeter mounted on the Punto 5 loudspeakers, the l'Acoustical MDT 26.1, a component used also on the ONE, is produced by VIFA over an original Aliante project. Is a metal (aluminum) dome speaker, featuring a phase corrector which, very cleverly, protects the same dome from damages (you never know why the metallic dome do ineluctably attract the attention (and the finger!) even of the most disregard observers...). This component also features a double magnet, a decompression chamber, a progressive back emission damping, a ferrofluid gap, and a voice coil with a cooled alloy support, and a resonant frequency around 500 Hz. The woofer is more traditional, an 11 cm black polypropylene diaphragm with rubber surround component, cast alloy basket, cooled magnet assembly and resonant frequency just about 50Hz. With those speakers, it has been possible to realize, for the Punto 5, a first order crossover (6 dB/ott. ), without making use of a compensation network, that utilize polypropylene Acoustical Audiocap capacitors, and it's wired with Monster Cable XP cables. The cabinet is a MDF and solid walnut wood, and the bass reflex port is opened on the upper part of the backside of the speaker. In the lower part you'll find, in an encased position, the binding posts for the power cable which, do accept forks and jacks and are ready for bi-wiring/bi-amping. The overall declared efficiency is around 86 dB/W/1m, and a maximum RMS power of 65W (100W Max.) and with nominal impedance of 8 Ohm (minimum 6,5 Ohm). So there is no problem for any amplification that holds that name. With an 8 Kg weight and a 180x290x320mm size, Punto 5 can be considered to full title a mini loudspeakers. For the listening sessions, the speakers have been placed on 70 cm height stands, quite far from both the rear wall (more that one meter and half) and the lateral one (about one meter). Being brand new, they have immediately showed an excessive brilliance in the high midrange and a bass having a quite inadequate coherence and voice. Being honest, the provided information manuals suggest not to came out with a critic evaluation of the speakers before they have played for less than thirty hours. That the reason why I started, unwillingly, to follow the (very boring) break in routine. A couple of week later, the Punto 5 does seem another pair of speakers: the metallic tweeter ended its attempts to put fear to myself, and the woofer starts to get loud and has acquired substantial qualities in terms of density and agility. I can, then, appreciate a coherent and homogeneous sound, unexpectedly warm and correct at the same time, that is marked by a profound and equilibrate mix of the different values. The bass region is not particularly very deep, but is full and enjoyable, being unexpectedly meaningful considering the cabinet dimension. The small woofer goes up in the frequency, this being a benefit for the midrange cohesion, which is expressed by a sound and noticeably liquid timbre. It is not possible to hear any interruption in the cross range with the tweeter which, on its side, does produce a very intriguing sound, with a special high midrange presence, that give to instruments reproduction, like drum cymbals, a "metallic" (is it for a case? :-) and deep realistic feeling. A good level of openness is definitely (and enjoyably) expressed by this product. For what regards dynamics, the Punto 5 do confirm their balanced character: microdinamics is, indeed, expressed in a precise and moderated manner, and the small impulsive information are never put too much in evidence. There is, then, no excessive contrast with macrodinamics which , for a matter of course (the physical dimension of the system), cannot get to a level able to render the "great" sound with an high grade of realism (even if I've to admit that, with the right drive, the Punto 5 are able to reproduce an adequate dinamic impact, at least up to the reach of their phisical limitation). The soundscape rendering is precisely what you expect to find in pair of miniloudspeakers as the Punto 5 are: wide and deep (without any embellishment), with well defined soundstages and an accurate focus of the elements composing them, and a good feeling of inter instruments space. To sum up, extremely balanced (here we are again...) and enjoyable, thanks to a general and distributed natural feeling. Even on the speed side, the small Punto 5 do not want to show off, and the musical message gets through with a certain feeling of fluidity more than jitteriness, never giving the feeling to be a slow system. Transparency and introspection are of a good level, basically aligned with the quality level of the other parameters, and it does not get tiring to follow the reproduced sound architectural texture. The binding posts, being encased, are definitely uncomfortable to use and, given their configuration, hard to screw. Moreover, they are too near one to each other, something that makes things more difficult. The Punto 5 does need a quite long break in time. Listened while brand new, do show a bass and midbass range that is barely articulated and an high midrange that does not hesitate to give very annoying "sabering", ready to damage the hear of the unaware listener. Beware then of the listening session in the shops with components just removed from the packaging! I believe that all Aliante products are equipped with felt rings to be placed around the tweeter. Even in this situation, they showed their importance, and their use has produced remarkable results in my listening room. A serious and ready product, designed for the ones who likes to listen music in a not too wide room, which is able to exploit its high (topnotch) balanced and homogeneous qualities, in a wise mix among various components, none of which is lost in favor of the others. They do not outperform in any specific parameter, but they do everything quite well. During my listening test, the Punto 5, have been connected to a much more advanced system as regards as the one that, likely, should be, reasonably, put side of them, and even compared with five times more expensive loudspeakers. In conclusion, they have been really worn out, and remarks done till this point do have a more absolute value (at least for what are my personal parameters) than in relation with their price. They have, however, stood up for their character without any awe, giving up just slightly on the side of the overall quality.